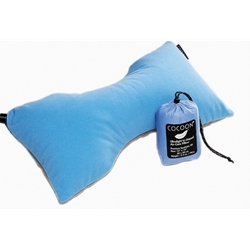 The Cocoon Air-Core Lumbar Support Pillow combines the comfort and support of superior synthetic pillows with minimal packing size. It features an inflatable air core underneath a layer of premium synthetic fill for lumbar support, when and where you need it. Great for camp or cabin. Inflatable air core underneath a layer of premium synthetic fill for cushioning and support. Twist valve allows you to customize your level of firmness, for your own personal comfort.